Find answers to commonly asked questions about the blacklist remediation process. The best way to prevent future email blacklistings is to follow email deliverability best practices. Please note: for any specific questions about your case, reply directly to the email you received from the Email Deliverability Team. How was this remediation list created? How do I opt out this list? Is this related to recent bounce or spam compliant rates? How do I get delisted from Spamcop? How will this remediation process help? I’m concerned about losing valuable contacts and leads. Will my permission pass campaign cause another blacklisting? Can I still send transactional email to these contacts? Can you provide examples of permission pass campaigns? I checked the box, “Don’t send to contacts with low engagement” on the campaign that caused the blacklisting. How can this be? Do I need to include contacts who were recently added to my database in my permission pass campaign? Do I need to include contacts validated through a third-party list in my permission pass campaign? Do I need to include contacts with low Sends Since Last Engagement in my permission pass campaign? Are there any exceptions I can make to the remediation list? The list created by the Email Deliverability team (Delivered blacklisted campaign. No recent opens.) contains all contacts that received the blacklisted email campaign and haven't opened any email in the past year. The spam trap that caused the blacklisting is included in this list. Opting out this list will prevent future blacklistings. To opt out all the contacts in the remediation list (Delivered blacklisted campaign. No recent opens.) in your account, you'll need to export the list from HubSpot and import it as an opt out list. If you opt out this entire list, you don't need to complete a permission pass campaign. Is this related to recent bounce or spam complaint rates? This is not related to bounces, unsubscribes, or spam reports. These are all actions taken by real recipients or receiving servers. Spam traps are real emails maintained by blacklist operators, so they won’t bounce. They also won't engage with the email to unsubscribe or mark the email as spam. Spamcop is a third party blacklist operator used for email security. They collect IP addresses and publish them publicly on their blacklist. Spamcop owns and operates spam trap addresses. When one of their active spam traps is included on an email from our servers, it will cause that IP address to be blacklisted for the next 24 hours. Spamcop blacklistings automatically expire after 24 hours. Completing the remediation process will also lead to better inbox placement and fewer soft bounces. Sender open rate is one of the biggest factors inbox providers like Gmail and Microsoft use to identify SPAM. After completing this process the spam trap and any other inactive email addresses will be removed, and you'll see fewer soft bounces across all of your recipients. The list created in your portal only includes unengaged contacts. These contacts are lowering your overall open rate, which is the number one factor that inbox providers will use to determine if incoming email should be sent to the spam folder. If you've engaged with these email addresses somehow within the last year, you can omit some of these email addresses from your permission pass campaign. No, blacklist operators don't try to penalize senders who are in the process of resolving the issue. As long as it's a recognizable permission pass campaign, then this email should not cause another blacklisting. Yes. Transactional emails can still be sent to contacts who have been opted out of all marketing email. Yes, here are a few examples from other HubSpot customers. The Don't send to contacts with low engagement checkbox would not suppress a spam trap if it's a new contact in your system. This feature uses a suppression list called Contacts with Low Engagement, which includes contacts who haven't clicked or opened the last 10 emails (or more) they've received from you. Yes, contacts with a recent create date are included because of the possibility of this being caused by a 'Recycled' spam trap. In order to effectively resolve this issue we can not use Create Date as a criteria for exclusion from the list. Yes, a spam trap would appear valid to almost all list validation services. List validators test whether or not an email address will bounce, but spam traps are deliverable addresses that will not bounce. Yes, the contact property 'Sends Since Last Engagement' is incremented for every email a contact is sent without opening. A spam trap will never open an email, but if the address was just added to your database it will have a value of 0 for this property. Customers: You don't need to opt out contacts who have made a purchase from you within the past 12 months. You can make a smart list of contacts where the Became a customer date property is less than 52 weeks ago. Contacts who have opened or click another email you've sent through another email service provider: If you've used another email sending provider in the past year, you can exclude any contacts who've opened or clicked an email within the past year from your remediation list. Site visitors: You don't have to send a permission pass campaign or opt out the recent site visitors within the past year. To filter these contacts out create a list of contacts whose Time Last Seen property is less than 52 weeks ago and exclude that list from the remediation list. Form submissions: You don't have to send a permission pass campaign or opt out contacts who converted on your site within the past year. 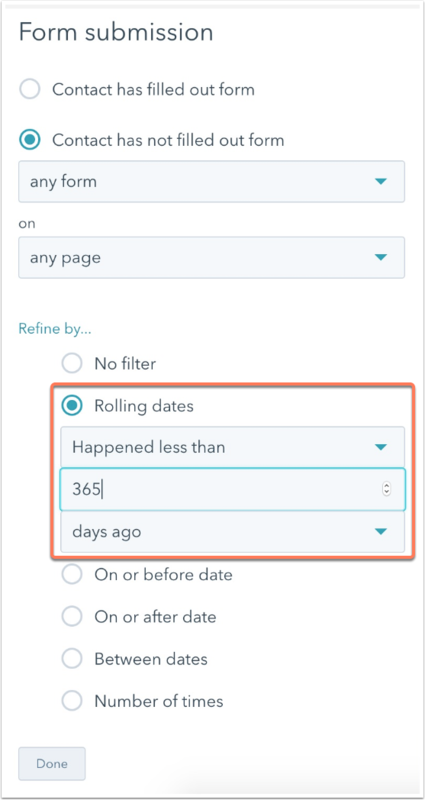 To filter these contacts out create a list of contacts who have filled out any form on your website less than 365 days ago and exclude that list from the remediation list. Please note: if a site visitor's email address was entered incorrectly in your database or via form submission, then this email address could be a spam trap.